The first time I ever went caroling was as a Brownie Scout in 1960. Armed with our carol booklets, provided by the John Hancock Life Insurance Company, we went to the homes of people in the community who had chronic illnesses. We sang Here We Come A-Wassailing and O Come, All Ye Faithful and finished up with Silent Night, our shivering bodies crowded together on the front porches of each house along our route. After serenading half a dozen families, we returned to our Scout meeting room for hot cocoa (spiked with candy canes) and home-baked cookies. For the rest of my childhood and high school and college years, going caroling was, if not annual, at least often a part of my Christmas season. 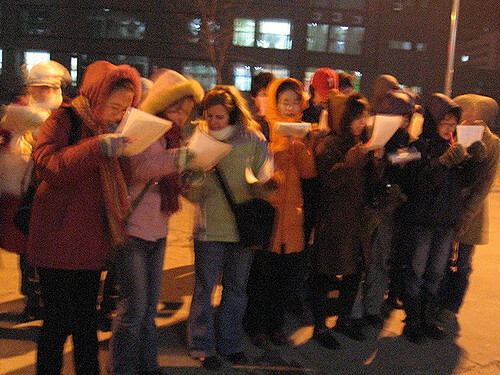 And groups of carolers occasionally came to sing on our front porch. Alas, not all of my contemporaries partook of this tradition. When Greg and I had been married for a year or two, he bought me a Wurlitzer electronic piano that fit in our tiny living room and could be easily transported. Planning to spend Christmas Day with my in-laws, I insisted we bring the piano along, so we could all sing carols together. What a bomb. My husband’s family would rather stick needles in their eyes than sing around the piano. They were quite content to let me play while they conversed. I felt like a lounge musician. These days, my caroling cravings are satisfied at Christmas carol services at church, but I long for the olden days when going door-to-door was common. Do you go caroling? Do you have any caroling memories? What are your favorite carols? Share in the comments below. Alas, it seems like caroling has gone bye bye. I miss it too since it was a part of my life for years. Shall we try again? The women’s bible study at my church had their Christmas luncheon last week, and part of their tradition is to sing carols. It just filled me with Christmas spirit. I was in choir in high school and in the adult community choir in my 20s. What fun we had piling in the back of a truck going around caroling. Sometimes it was a little sad, as we visited older people, shut ins, and the nursing home. Several people who lived in big mansions would plan Christmas parties around our caroling, so we got to partake in their goodies after we sang at their party. If you weren’t so far away, I’d plan a Christmas party around you caroling at our house. I’d even tell Greg he can’t close the door in your face. I did love caroling when I was younger, but I no longer have a voice, and nobody in our neighborhood carols. 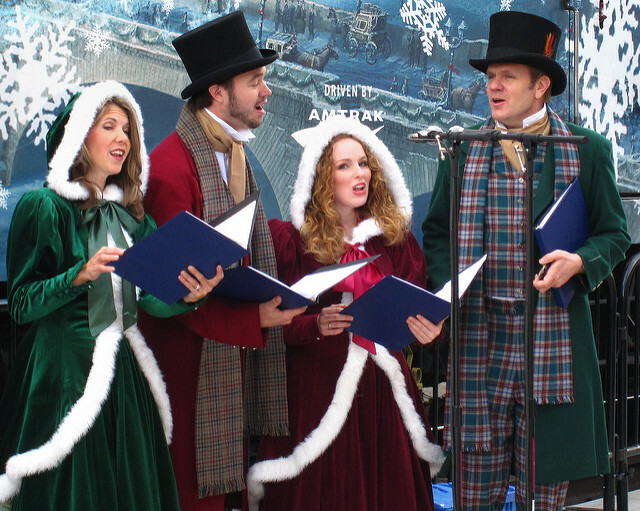 My favorite time was caroling on the cable car in San Francisco with a bnch of professional singers. We went from one end of the line to the other end, when we got out at the Buena Vista cafe and all went to have Irish Coffee (which the cafe had just invented a few years before). We went caroling here a couple of time, once at a nursing home where another group was also caroling and we had dueling carols. Another time a small group of us, armed with kazoos, went caroling at a friend’s house.